What do you need for a successful revolution? Oppression, passion and a bunch of insane people willing to do anything for the cause. revolt! Marat/Sade is truly an epic revolution! Right Brain Project is always a unique experience. I never know what awaits me upon arrival. This time, three nuns greet me with goblets of water and woven fans. Amused, I take my supplies into the small space. There are 24 seats in the theater and it’s already warm. Behind black curtains, I hear commotion. It sounds like a bunch of third graders getting ready for the Christmas pageant. There is shushing, giggling and ever so often a nun scolds. When the production starts, the curtains pull back to reveal a very diorama-like stage. Twenty-nine performers mostly clad in deranged attire (Costume Designer David Wesley Mitchell) are positioned throughout this deep space. The initial visual is flabbergasting. Throughout the show, characters vie for my attention. The ever-present cast is just fascinatingly wacko. Under the masterful direction of Nathan Robbel, this play within a play is organized chaos. Playwright Peter Weiss penned an intriguing tale of the real life revolutionary, Marat and the legendary sadist, Marquis, who *did* stage asylum productions. And this committed cast magnificently sings, gropes and acts like loonies playing actors playing revolutionaries. The entire enterprise is mind boggling. There is so much, literally, in-your-face stuff going on in a fairly small area. It’s certainly close quarters like being in a locked down psycho ward. And that’s what drove me a little bonkers. I loved the almost interactive piece of the production. But I got warm and uncomfortable in this loony bin. And the night I went, it was cool out. When you get 53 people together in close quarters, they are going to generate some heat. And even with all the singing about copulation, it’s the stuffy kind of heat. 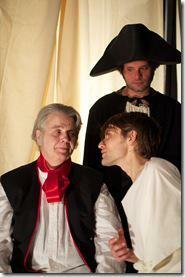 I recommend seeing Marat/Sade, but plan for it. Take the water. Take the fan. And consider wearing a hospital gown. It’s light, flimsy and you’ll fit right in with the other nuts.